I love smoothies especially in warmer months. It’s a quick & easy way to get a variety of food groups (dairy, fruits, and veggies) and nutrients including protein, fiber, and micronutrients into our body. 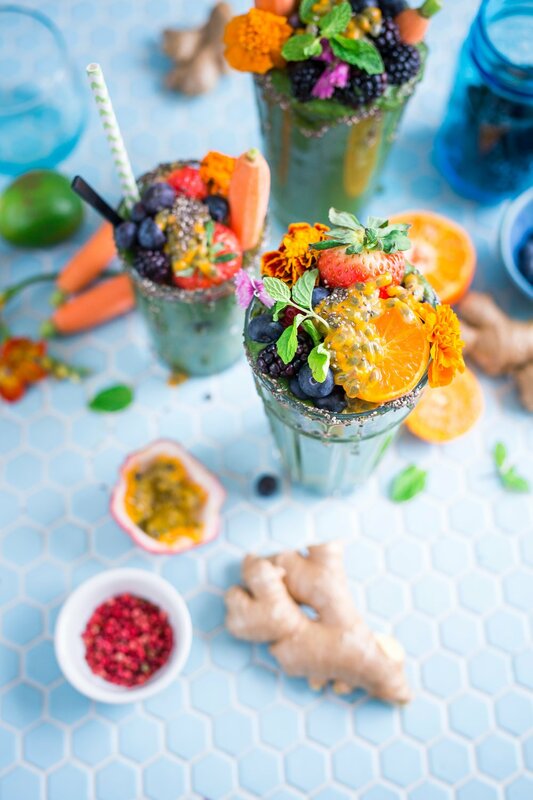 If you are new to the world of smoothies, check out my post on “Guide to Making a Smoothie” & for my smoothie-veterana, I hope you will find new ideas to jazz up your smoothie routine. I am sharing 10 nourishing add-ins for you to try and feel amazing inside out + few of my favorites recipes and tips. Chia seeds : Tiny energy- boosting seeds are packed with protein, 3 X the concentration of essential fatty acids than most grains, and are rich in trace minerals like copper, zinc, magnesium, and selenium. Add 2-3 tablespoon in your smoothies daily and make sure to use a powerful blender. Avocado : Packed with healthy fats, fiber and loads of vitamins (including K, C, and E), slightly ripe avocado adds a creamy consistency to green smoothies! Use about ⅓ avocado to blend into a smoothie and make sure the avocado is on the ripe side. Cinnamon : Ground cinnamon adds a subtle sweetness and warmth to a smoothie without all the sugar and calories of typical sweeteners. As little as ½ a teaspoon of ground cinnamon has shown to lower blood sugar, so even more reasons to add few dashes of ground cinnamon into a smoothie. I like mine particularly with peanut butter and banana combination. Spirulina powder : Spirulina, a superfood made from pond algae is high in protein, omega fatty acids, and concentrated sources of many vitamins and minerals. It has a very distinct fishy seaweed taste and needs to be balanced out by combining with sweet fruits like bananas, pineapple, and mango in a smoothie with 1 teaspoon of spirulina powder and you can gradually work your way up. Cacao powder : The rich, chocolatey cacao is packed with magnesium, fiber, iron, and loads of antioxidants (flavonoids help improve mood) is good for your body & soul. Blend 2-3 tablespoon of cacao powder with frozen banana, milk, cinnamon, and nut butter for a quick breakfast or an afternoon snack. If you don’t have cacao powder, cocoa powder is a good substitution. Hemp Seeds : A tablespoon or two of hemp seeds in your smoothie is a perfect way to get your essential fatty acids, protein, and many other essential nutrients, all of which are beneficial in fighting chronic diseases too. Unlike chia seeds, these are much softer and won’t require a high-speed blender. Hemp seeds can also be used as a topping on your smoothie bowl. Ginger : Ginger has been long known for alleviating GI issues, nausea, and arthritis-related pain because of it’s anti-inflammatory properties. A thumb-size fresh ginger root in a smoothie with apple, pear, or mango is a great way to enjoy all the benefits. I love adding ginger to smoothies with apples or berries such as Wild Blueberry Ginger Kombucha Smoothie. Kefir : Swap yogurt with kefir as it adds more probiotics (good bacteria for your gut) for a chance. It tends to be easier to digest even for people with lactose-intolerance. Kefir is also a great source of calcium and vitamin K2 which are both important for bone health. If you are new to kefir, give Mango Cardamom Kefir Lassi a try! Dates : Naturally sweetened dates are great source of fiber, copper, iron, and potassium. They are wonderful for replenishing energy quickly due to it’s simple sugar like fructose and dextrose. When making a date-based smoothie, puree pitted dates first then add other ingredients for a smooth, creamy smoothie. Older dates are little hard and may require pre-soaking in hot water. Almond flour : Add about ¼ cup of almond flour into your smoothie for a quick protein, healthy fats, and vitamin E boost. For additional vitamin E, make sure to use natural almond flour as they have the skin intact unlike blanched almonds. Are you a smoothie drinker? Share some your fav add-ins and tips!